Welcome to Sacred Tree Essences! Lapis Lazuli is a stone of peace inner vision, truthful communication and spiritual connection. It enhances intuition, visionary awareness and deepens meditation. Associated with the third eye and throat chakras. All our crystals have been charged and energised with healing energy. Lapis Lazuli is a stone of peace, inner vision, truthful communication and spiritual connection. It enhances intuition, visionary awareness and deepens meditation. Associated with the third eye and throat chakras. 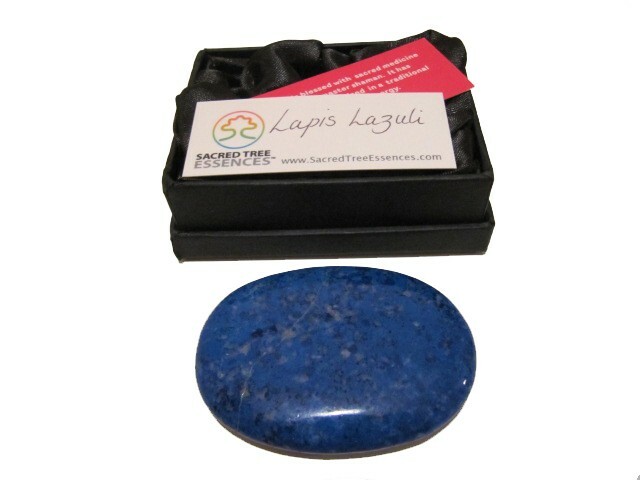 This beautifully polished 'A' grade Lapis Lazuli palmstone (7x5cm) comes in a satin lined box making a lovely gift. This crystal has been blessed with sacred medicine songs (Icaros) by a master shaman. It has been energised and charged with healing energy in a traditional Amazonian way.